DeSoto State Park – Take the opportunity to commune with nature in DeSoto State Park. We offer overnight accommodations such as rustic cabins, modern chalets, campgrounds and motel rooms. Some units are handicap accessible. A No pet policy applies. Hiking and Biking trails, swimming pool, tennis courts, playground and picnic area are just part of what awaits you in this park. Voted as one of America’s top 10 state parks by Camping Life Magazine in their April 2006 issue! View majestic scenery, waterfalls and canyons. Walk the 1,000-ft. Azalea Cascades Boardwalk Trail. Check out our weekend interpretive programs and guided hikes we have planned all throughout the summer and fall seasons. All programs are free to the public and guests of the park. Call 256-845-0051 to inquire about interpretive programs and 800-568-8840 for rooms and cabins. Little River Canyon Center – This center is a Jacksonville State University facility operated in partnership with the National Park Service. Located on Hwy 35 and adjacent to the Little River Canyon National Preserve, it serves multiple functions as a center for outdoor interpretation, architectural sustainability, cultural demonstration and it serves as an administrative center for its related agencies. Visitors may experience an array of Field School activities including wildlife watching, hikes, and other family oriented programs. The Canyon Center includes public restrooms, walking trails, exhibits, a gift shop, a library, an auditorium and meeting rooms which may be rented by the half or full day. For more information please call 256-845-3548. Cloudland Canyon State Park – One of the region’s finest preserves, its 2,200 or so acres embrace a cluster of ravines and waterfalls. With elevations that range from 800 to 1,900 feet, this is rugged terrain but well worth exploring. 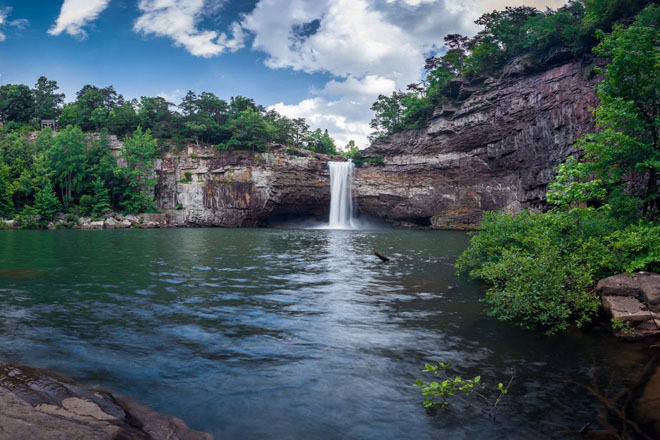 Exhilarating panoramas of the hills and hollows will prepare sightseers for the grandeur that awaits at Cloudland Canyon itself, a deep cleft slashed into shale and sandstone by Sitton Gulch Creek. For a front-row seat, stop at the park’s main picnic area. (800) 864-7275 or (706) 657-4050. Lookout Mountain Hang Gliding – This is the world’s largest hang gliding resort and training center. Five times more certified mountain hang glider pilots are trained here than the next largest school in the USA. They cater to the flying needs of folks from one flight with an instructor at your side, to multi-day lessons to have you fully trained up to expert skills. Open Thursday thru Monday, 9 a.m. to 6 p.m. Located at 7201 Scenic Hwy. in Rising Fawn, Georgia. Call for reservations at 703-398-3541 or 877-426-4543.